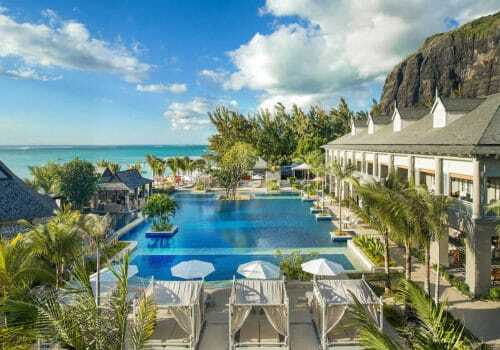 Lavishly appointed villas and pampering coverage on the white sands of Le Morne Beach at this luxury 5-star hotel in western Mauritius. Marvel at the endless views over the warm turquoise lagoon that magically blend with the glistening waters of the Indian Ocean. Discover the resort’s world class sporting facilities that include kite surfing, surfing and premier diving, or experience the seductive and elegant surroundings of the on-site Iridium Spa. Indulge in five distinct culinary experiences, The St. Regis Mauritius Resort offers epicureans a myriad of gastronomic influences ranging from French-inspired and traditional Mauritian cuisine to the exotic dishes of South-East Asia and fine Japanese selections. Beautifully appointed rooms with spectacular garden views. Beautifully appointed rooms with spectacular views over the Indian Ocean. Beautifully appointed Junior Suites with spectacular views over the Indian Ocean and a large outdoor living space. Centrally located in the main building of the resort, our Manor House Suite will take you back to the time of the original private residences where guests can relish in unobstructed views of the Indian Ocean. Giving our guests a residential feeling, the Manor House Suite provides private in-room spa treatments from our luxurious Iridium Spa. The Beachfront St. Regis Suites are stunning one-bedroom suites with a separate indoor living room and spacious outdoor terrace or balcony, just footsteps away from the shores. Giving our guests a residential feeling, this suite comes with generously sized living room, dining area, spacious bathroom with massage table and walk-in dressing room. The St. Regis Mauritius Villa epitomises the St. Regis commitment to refined luxury and bespoke attention. Nestled in lush tropical surroundings, and with the ocean lapping literally at its toes, the private villa has been designed to exceed the expectations of the most travelled connoisseur. Two spacious suites with exquisitely appointed interiors; refined fittings and delicate textures create a homely ambience enhanced by generous volumes opening out onto the ocean. A compelling invitation to island indolence. Each suite has full direct ocean view and opens up to a private timber deck with private sun loungers and direct access to the beach. Located on the western side of Mautitius, this luxury 5-star resort has 172 guest suites. The St. Regis Butler Service provides a comfortable stay in which guests can completely relax. Complimentary activities include snorkelling, waterskiing, and windsurfing. The hotel features an award winning spa, fitness club, stunning pools, a kite flyers club, and water sports centre. A speak-easy bar serving drinks and cocktails.